Will the Right Paint NYC’s Next First Lady as an ‘Angry Black Woman’? 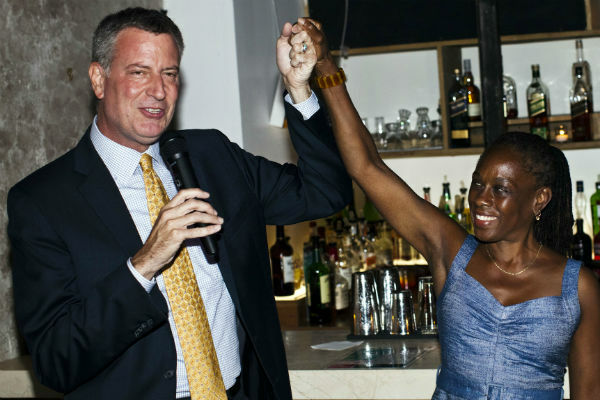 After tagging Bill de Blasio a “commie,” how will they twist the image of Chirlane McCray? After establishing that NYC mayoral candidate Bill de Blasio is a “Marxist communist with a history of supporting terrorism,” (as Glenn Beck did this week), how much farther can the right-wing media go? The precedent is there: Remember how the right hammered Michelle Obama during the 2008 campaign for saying, “For the first time in my adult lifetime, I’m really proud of my country,” (a remark she later put into context) and for supposedly spouting off about “whitey” in a video (which turned out to be a hoax). In a front-page profile in yesterday’s New York Times, McCray comes across as a fascinating, dynamic woman. But to the right, the narrative of her life is ripe for distortion. Growing up, she was the victim of frequent, vicious racism; and for the Becks and Limbaughs of this world the real crime of racism is that it makes black people want retribution. She was the seventh-grader too frightened to stand in front of the room because her white classmates would mock her, contorting their mouths to make their lips look big. She was the smoldering teenager who took to writing poems every day to wrestle with her isolation and anger. She was the eldest daughter of one of the only black families in Longmeadow, Massachusetts, who arrived home to see their new house scrawled with racist graffiti. Now in the mayoral race, McCray is a top dog, “a mastermind,” the Times writes, “behind the biggest political upset of the year.” Political meetings are planned around her schedule. She sits in on job interviews for top advisers. She edits all key speeches (aides are known to e-mail drafts straight to her). McCray and de Blasio are as much a package deal as Bill and Hillary Rodham Clinton, a reality etched into the campaign hierarchy affixed to a wall of the de Blasio political headquarters. It lists “Bill/Chirlane” above a sprawling team of aides. She may even one-up Hillary: She acknowledges feeling so passionately in 2002 about which way her husband would vote on the next City Council speaker she threatened to divorce him if he backed the wrong candidate. He sided with his wife. In other words, if the “angry black woman” charge doesn’t fly, the right could always reposition Chirlane as a ballbuster who controls Bill’s every move—which would neatly position the big guy as a major wimp. Of course, such twisted depictions may not surface, or they may burp up only in the national media—Fox, hate radio, Drudge. The local wolves, like the New York Post, will have to tread more coyly. After all, this is New York, which will champion Chirlane and Bill’s equal relationship (though let’s hope not as “Billane”). Anyway, de Blasio won the Democratic primary in every borough and won big. Oh, Glenn Beck has a theory to explain that, too. The Anthony Weiner sexting scandal, see, was “just a distraction,” used to divert media coverage so that “a guy that slipped in that nobody paid attention to, Bill de Blasio” could turn New York City into a communist terrorist utopia. Leslie Savan calls out the media’s uneven reporting on de Blasio and Lhota’s ideological histories.